My New Teacher and Me! is the follow-up to Weird Al's acclaimed 2011 children's book When I Grow Up (available as a standard book and as a newfangled iOS app for your iPad!). I arrived at the store about three hours before the signing (incidentally, Quail Ridge Books is a really nice independent bookstore: I'm gonna make it a habit of swinging by there any time I'm in the Raleigh area) and bought a few copies to get signed. I wound up reading My New Teacher and Me! in the interim and found it to be a delightful and well-crafted (and funny) sequel to the first book. I hope Al continues with young Billy's story and gives him at least a trilogy! 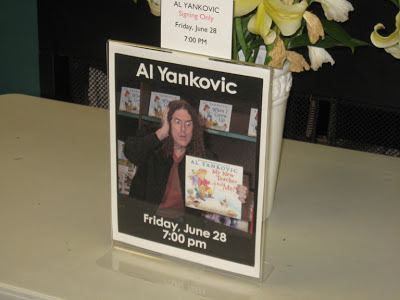 Well anyhoo, 7 p.m. arrived and Al Yankovic (that's how he's billed in literary circles, not as "Weird Al", so I'm gonna try to respect that for the rest of this post) came out and began signing and posing for photos. I don't know how many came to Quail Ridge Books on Friday night but there had been over 800 at his previous stop in Cincinnati the day before. If I had to guess, I would estimate at least 400 people and maybe even 500. It was a little after 8 when my turn came to approach the table where Al was situated. And along with the two copies of My New Teacher and Me! 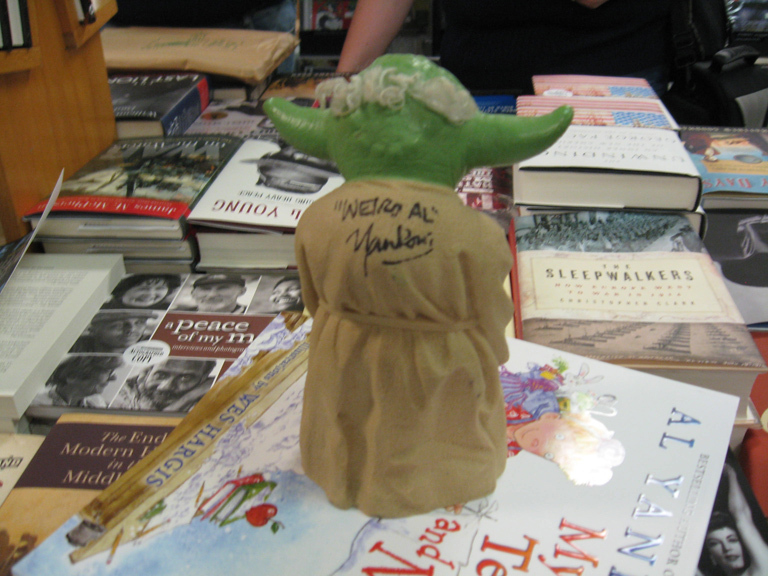 I had something else that I was hoping he could sign: my vintage Yoda vinyl hand puppet, bought all the way back in 1981. 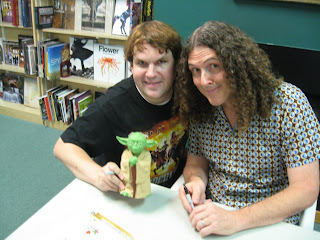 I figured that since his big finishing song at the end of every concert is "Yoda" - and since he had the same kind of puppet as a prop in his very first MTV special - that it might have been worth a shot. Well, as soon as I walked to the table Al saw my puppet standing atop my books and he said "Hey, I used to have one of those!" I gave it to him and he put it on his hand and started playing with it... yes, "Weird Al" Yankovic himself (I know, I slipped from established protocol there but I couldn't help it) started playing with my Yoda puppet!! 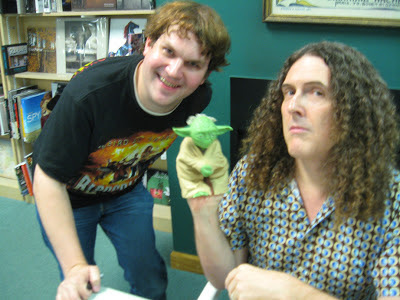 He put it on his right hand and began talking like Yoda and then he said "Or you could play with him like *this*" and started punching Yoda like a boxer. Don't even think of asking to buy this from me! You will never, ever, EVER find this listed on eBay. Not as long as I'm alive... and I'm planning on being alive for a heap long time. That lil' Yoda puppet had sentimental value before, and it's got even more now. Thanks to Al for coming to Raleigh, and thanks to Quail Ridge Books for hosting him! And I heartily recommend My New Teacher and Me! : a fun lil' book for children ages 6 to 600.